Professionals tend to make things seem very complicated, in an effort to make the the recipients of their advice feel stupid, afraid, intimidated and prone to follow orders. Let’s pick a profession like medicine. Why do doctors use such ridiculously complicated terms? They could easily substitute ominous-sounding symptoms for “boo-boos” and take all the stress and anxiety out of the situation. They don’t do it because it would diminish their feelings of omnipotence. 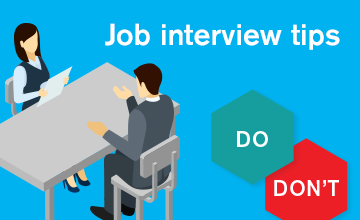 Since I don’t really care about all that, I’ll omit any pretentious advice and only share with you some simple hacks of how to approach an interview. We need to start with the premise that the interviewer has a couple of important needs to be met. Primarily, they desire for their lives to be made easier by hiring someone. They would also prefer the person to adequately accomplish the job at hand, be relatively pleasant to work with and, hopefully, the prospective employee would have the boss’ back when needed. “Yes, I am highly interested in the role.” When you let a hiring manager know that you are interested, it makes the process much easier. The manager breathes a sigh of relief and recognizes that the candidate is onboard and sold on the opportunity. It is like middle school all over again; if you know that the cute girl/boy in class likes you, you will be more apt to ask her/him out on a date to see a movie. “What would someone need to do to become successful in this role?” Instead of mindlessly talking about yourself, hoping to stumble upon what an interviewer wants, just ask them. Once you inquire as to what is required and the hiring manager provides a concrete answer, you could then share specific skills, experience and activities you engaged in that will enable you to succeeded in the new job.“How can I best help you?” Who wouldn’t want to hear that? That one simple sentence demonstrates to the manager that you care and truly desire to help. “Yes, I researched all about the company.” Then, share some pertinent insights and knowledge that you gathered about the company. It shows that you did your homework and are interested in the company and not just haphazardly interviewing. “Yes, I read the job description thoroughly.” Share your understanding of the job, its requirements and how you meet them.“I checked out the LinkedIn profiles of people at your company to see their backgrounds.” It may sound a little stalkerish, but interviewers want to know that you came to the interview prepared. By researching the company, it demonstrates your motivation, interest, intellectual curiosity, drive and sincere interest in the role. There are other questions to ask and statements to make, but I think you get the message. The goal is to portray yourself as someone who wants to help contribute, has done your homework and arrives prepared. You want to avoid coming across as a prima donna demanding entitlements. Rather, you want to convey that you will contribute in a positive and meaningful way. Yes, it is that simple. The hiring manager will view you as a breath of fresh air—a person who is motivated, polite, professional and possesses the qualities and willingness to do the hard work necessary to succeed.